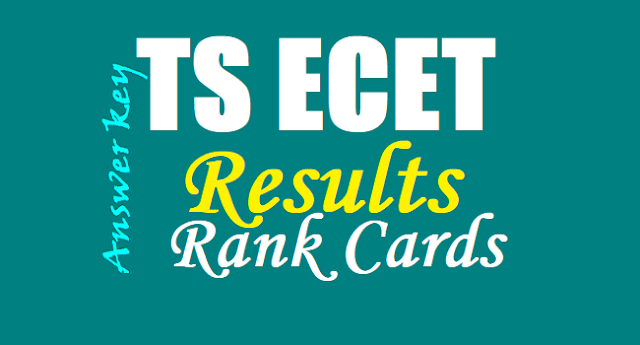 TS ECET 2019 Results/ Rank cards at ecet.tsche.ac.in/ TS ECET 2019 Results/ Rank cards/ Preliminary Key/ Final Key @www.ecet.tsche.ac.in: A Common Entrance Test designated in full as Engineering Common Entrance Test for Diploma Holders and for B.Sc. (Mathematics) Degree Holders and in short as ECET [FDH and B.Sc. (Mathematics)]-2019 will be conducted by JNT University, Hyderabad on behalf of the Telangana State Council of Higher Education for the academic year 2019-2020 for B.Sc. (Mathematics) degree holders. JNTU Hyderabad issued the Telangana ICET 2019 notification in March, 2019 and the University invited online applications from the eligible candidates from ..-03-2019 to ..-04-2019 through online mode at its web portal www.ecet.tsche.ac.in. The Students who were applied for this stream, they were appeared the engineering common entrance test 2019 which was conducted on ..-05-2019 and appeared students are waiting for their results. Candidates can check their results from telangana ecet web portal http://ecet.tsche.ac.in/index. T Papi Reddy, Chairman, Telangana State Council of Higher Education released the results of the Telangana State Engineering Common Entrance Test (TS ECET) at Jawaharlal Nehru Technological University-Hyderabad (JNTU-H) at 4 pm on Thursday. Candidates can view their result on the website http://ecet.tsche.ac.in. TS ECET 2019 Results to be announced on May .. at ecet.tsche.ac.in: The Jawaharlal Nehru Technical University Hyderabad (JNTUH) has announced that the results for the Telangana Engineering Common Entrance Test (TS ECET) will be declared tomorrow. Candidates can check their results from the official website and this page for updates. The examination was conducted for Diploma holders and for BSc (Mathematics) degree holders for admission to Bachelor of Education (BE), Bachelor of Technology (BTech) and Bachelor of Pharmacy (BPharm) courses in the state from the academic term of 2019-2020. The exam was conducted on May .., 2019 from 2 pm to 5 pm by JNTUH on behalf of the Telangana State Council of Higher Education. Question papers, preliminary keys, response sheets and objections are already available on the official site for candidates to cross-check their answers. The time for raising objections, however, is over. How to check the TS ECET 2019 score cards: Go to the official website for the examination (ecet.tsche.ac.in). ; A notification will be displayed once the results are announced. ; Click on the results notification for TS ECET 2019.; Enter your details in the fields provided and submit the information. ; Download your results and take a print out of the same for further reference.